This wonderful old house was built in the late 1800s in Concord, Massachusetts, and homeowners Alex and Andrea say that little had been updated since. That meant that most of the original details were intact, but it took a lot of work to do to make it a comfortable and family-friendly home. The living room fireplace is working again now. The screen was made from a refurbished cast-iron fireback. The architect on the project was John Battle of Battle Associates in Concord. 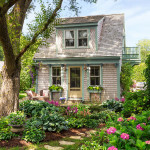 Visit This Old House to read the article by Deborah Baldwin and see the rest of the photos by Anthony Tieuli. I LOVE that inglenook! So cozy and warm. A hobbit closet?! Wow. I love that! Wowza! Absolutely gorgeous house. I love everything they did, and I agree with the Granny’s parlor thing. I don’t like Victorians with over the top wallpaper (walls and ceilings in multiple patterns), velvet furniture, etc. etc. That said, I’m in LOVE with the William Morris wallpaper in the dining room, as well as the inglenook and the dining room bench. I know where that house is! I drive by it quite often. I’ve always wanted to know what the inside looks like. Fantastic! No kidding? I’d be driving by this house verrry slowly each time and rubbernecking like crazy. Ha. I recently became aware that the complete series of TOH’s 2003 Concord Cottage Project is available to watch online at their website and YouTube. It’s 18 episodes of the team turning a small barn into a one bedroom cottage (less than 1,000 sq. ft.) It’s perfection even now 11 years later. I’ve seen every episode now at least twice! Oh, wow, that’s great. Thanks for the links, Chris! That house is fantastic!! The cottage pantry is just perfect and count me in as a lover of the inglenook as well as that bench in the dining room. Beautiful job. Ditto to everyone’s comments! 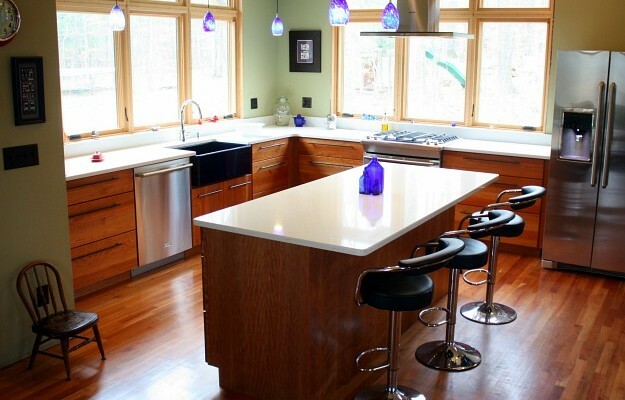 I’m especially impressed with the light and airy feeling , given all the wood trimwork, which is stunning. Couldn’t help but notice the built-ins .. the room to the left of the stairs, the pantry, and it wouldn’t be a surprise if the built-in benches in the dining room and inglenook were hinged. The detached garage looks like it’s always been there; what a wonderful addition to the property! Kudos all around. Wowza! What a pitch perfect restoration. Can you imagine having that house to work with in the first place? They have done a beautiful job. They only (small) quibble I had was the driveway and hardscaping outside the front door. It just made me sad seeing the concrete and asphalt, and wished they could have chosen softer, less 21st century suburban materials. What a beautiful old house. I love that the original details and woodwork are still there. I looked at the rest of the photos on This Old House. I love almost everything. I do think the master bath looks incongruous, too trendy/modern. However, I love all the woodwork and think the decorating is comfortable and family friendly yet elegant. I love the exterior, but the interior to me still screams “grandma’s parlor.” I don’t think they were terribly successful in that regard. What a beautiful interior. They managed to make it cheerful and functional while maintaining the home’s original character. That is not an easy feat. Bravo! What a wonderful renovation! Love, love, love. So glad they didn’t paint the original stained moldings – they add so much warmth and character. In our last house, we kept ours, and I love the look and cozy feeling. It really accentuates the size and profile of the wood trim, which you can’t get these days (unless you had it custom milled). It wouldn’t be nearly as beautiful painted white. Love the William Morris wallpaper, too. Lots of wonderful nooks and window seats. I always wanted an inglenook! What nice vibes that house gives. I toured several old houses in Concord … the well known ones that Hawthorne and Longfellow and Bronson Alcott lived in … places with that much history really do take on a life of their own. I especially was pleased to see PEOPLE in one of the pictures. I know we look here for the houses, but somehow the people bring the house to life! I agree, Becky. Always nice to see the homeowners in the photos, too!